In my recent review of Mavis Gallant's Paris Stories, I remarked that though not a general rule, if I'm taking an extremely long time with a book, it probably means that I'm not enjoying it. It was Ken Dryden's The Game that made me throw in the part about not being a general rule. I started this one way back in February I believe and just finished it this week, but I did enjoy it. I had designated The Game as a bathroom book, so you can attribute the length of time it took me to read it to the lack of fiber in my diet, not to a lack of interest. Which I was lead to believe wouldn't be the case. As someone who's hardly ever followed the sport, yet appreciated it nonetheless, I've read a surprisingly large number of hockey books that I've quite enjoyed; Night Work, King Leary, especially. 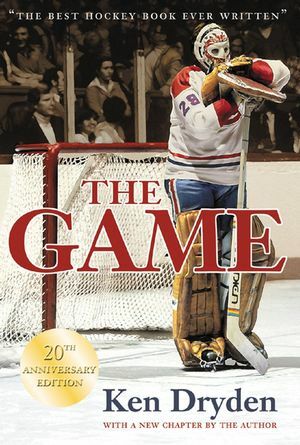 The Game, according to some, is "still widely regarded as the best book about hockey ever written, and one of the best sports books of all time." And during this year's Canada Reads debates, Dryden and his book's defender, Alan Thicke, suggested that the book had universal themes, it was about growing up, and the Canadian spirit. I expected the book to be about hockey, of course, but I was sort of hoping and expecting that it would be more than that. In Night Work: The Terry Sawchuk Poems, Randall Maggs managed to simultaneously tell a hockey story and a story of humanity, I'm not sure Dryden consistently achieved that. Sure there were a few times when a reader of The Game could take hockey and turn it into a metaphor for some aspect of life, sure the back story of Dryden's looming retirement could tug some heartstrings, and sure Dryden managed to show that team hockey players still manage to hold on to their individual personalities-- none of which could be considered small achievements-- but 90% of the time, the book is hockey, hockey, hockey and if you're not into it, it's going to be a dull game. I think where Dryden's book doesn't hold up as well, and where Thicke's reasoning is dated, is that hockey possibly doesn't have the same resonance to the Canadian psyche as it used to. Sure we say it does, but now it's akin to waving the Canadian flag, with it's giant red leaf, in Nunavut, where maple trees--any trees for that matter-- can't even grow. We enjoy the patriotism more than the sport itself. When my father was a child he lived and breathed hockey. He couldn't afford skates so he sometimes wore his brother's hand-me-downs and sometimes played in his boots, he played on a pond, no one wore equipment, and he gathered with his friends at a neighbour's house to listen to games on the radio. It was about fun. When I was a boy it became somewhat of a sore spot between us that I didn't share his enthusiasm for the game. The more he pushed, the more I resisted, until I eventually won. But as there's a certain sick sense of cosmic humour, my son came along, and lo and behold, he's a jock. Vowing not to get into the same rut as my father and I, I made a promise to support my son's interests, even if I didn't understand them. Hockey, it was. I can't say I enjoyed it. He was four years old and had practice 3 times a week with ridiculous ice times, the fees and gear were outrageously overpriced, and I was surrounded by parents who weren't going to be satisfied until his/her kid was drafted into the NHL. I found myself wondering again why people enjoyed this. Then my dad visited and I took the opportunity to find out; I'd take him to see one of my son's practices. Surprisingly he didn't enjoy it either. In fact, it made him angry. "When will they get to play?" he demanded. Not today, I had to tell him, today they were doing skating drills. "Tomorrow then?" No, tomorrow was stick handling and passing. But they usually spend the third day playing. Or at least half of it. And they get three minute shifts. My dad quickly realized that there stood a chance he'd get to see my son play hockey for a mere 15 minutes. "What kid's going to enjoy this?" he asked. And looking out at the ice, there were a few. Some kids love drills. Some kids draw the connection that they are learning skills to make them better for actual games. Some kids just love following orders. Most, including my son, actually didn't seem overly thrilled. Sure, my son got up, put on his gear and went, but my dad had a point. My son's initial enthusiasm to join hockey had waned. And mostly because this wasn't what he had in mind. As parents, my wife and I were interested in him getting exercise and having fun; to be the next Gretzky or Crosby wasn't in our plans. Sadly we were outnumbered. My dad's disgust was all we needed. The next year we joined him up to soccer. It's cheaper; at just one practice per week, less pressure; he's getting exercise; and while he's still doing lots of drills, he's playing actual games-- at EVERY practice! Most importantly, he's having fun. I know hockey hasn't died, I really do. Nor do I wish it to be. I went to a staff function recently where a large number of the men and a few of the women had discovered a TV in a backroom on which they could watch a playoff game. They were missing for most of the night. I get it. The small part of me that used to envy such passion for a game and the comradeship that interest seemed to bring, is gone. I've given up trying to force an interest that I just never had. My point with all this is that the Canadian hockey that Thicke and Dryden are describing, that's supposed to be part of the Canadian psyche, is dying. It's being replaced by something different, a business hockey, something that parents pay for and consider an investment. With that in mind, the hockey, hockey, hockey in Dryden's book might strike a chord with those who come from an older generation and remember it the way it used to be, but to pretend that it captures the modern day Canadian spirit is, sadly, a myth.